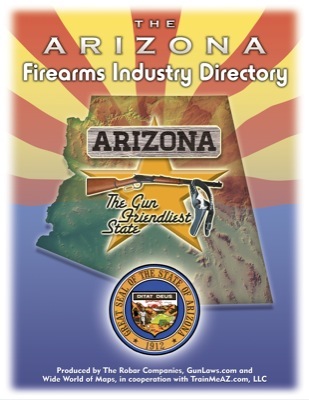 The first of its kind ever produced in the state, this is a comprehensive directory of the $1 billion Arizona gun business from commercial, industrial and consumer perspectives. Before this was produced by Scottsdale-based TrainMeAZ, LLC, no one had any real idea of how large the industry was, and the size took people by surprise. When you add in hunting and economic impact, the business easily exceeds $2 billion annually. This first edition will become a collector's item on top of being an invaluable tool for helping the industry connect to itself, and aiding in sales, political and legislative goals. An easy-reading 8.5 x 11-inch guide, each firm's listing includes complete name, address and phone numbers, and where available fax numbers. Most entries have websites and many include email addresses as well. Every company is briefly described and categorized for easy identification. AND -- Get the Arizona GUN MAP! The "Where-To-Shoot" guide to Arizona!